We package the entire range of products with industrial-grade wrapping supplies that are environmentally friendly and safe. Furthermore, the packaging is sturdy to protect against damage and to make sure the product is kept quality assured. Bulk, as well as a retail order of the product, can be fulfilled by us with ease. In addition, we guarantee to make delivery as per schedule. 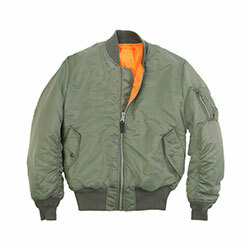 WB-2003 Bomber Jacket is highly breathable with a comfortable design and is available in a quality packaging.